Over the years there have been couple of recipes I’ve wanted to try but could never attempt for reasons plenty. 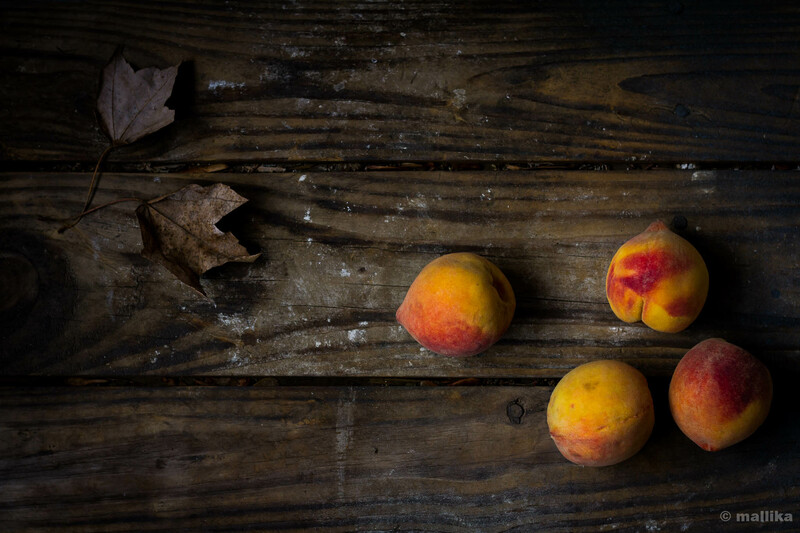 In a land where ‘certain’ ingredients used primarily in Western cooking were unheard of and almost impossible to fetch, I wouldn’t blame myself if I pushed those recipes aside. Fortunately though, today we live in a pretty diverse city which has access to many of these imported items, it is still a challenge to fetch a Filo sheet, Wonton wrappers or even Puff Pastry sheets. I have not been lucky yet. I have given up mt hands on a local whipping cream, then would you expect me to look out for corn syrup, xanthum gum, agave nectar, etc.? Thanking my stars, least I have access to some good dark chocolate, vanilla extract or butterscotch chips, not with ease though! Then, two years ago when my husband and me went on a vacation trip to Munnar and last year to Ooty, these marshmallows rocked my memories of those soft, pillow-like, melt-in-mouth candies. I had the freedom to enjoy couple of them there and packed a few to be eaten back home. Again as predictable it can be, marshmallows were never among my husband’s favorites too! So all that pack was devoured by me alone. Of course, to satisfy my husband’s chocolate addiction, our dear Rocky Road Bars were their counterparts! Being a vegetarian, I was ignorant then that the animal product, gelatin goes into making these marshmallows. Though it doesn’t bother me much, since I am not staunch about vegetarianism (it’s just our way of life… didn’t we consume cod liver oil as kids… or what about the capsules... were eggs ever vegetarian…? ), bringing home gelatin did bother me. Over the past two weeks I have been craving for marshmallows and my frantic search for stores in Bangalore didn’t lead me anywhere. Even the candy shops in malls ran out of stock. Are they kidding me??? I badly wanted to make them in my kitchen. Google gave ample recipes, most of them had one thing in common, corn syrup and gelatin. Corn syrup is an ingredient that is impossible to get locally and I would have preferred the recipe without gelatin. I’ve never used gelatin in the past, since agar-agar has worked mostly for me. I was skeptical how the marshmallows would turn out if agar powder was used. Despite all the possible research online, I concluded that gelatin was the only way I could get these right, at least for my first attempt. Again, since this was the first time I was attempting marshmallows, I decided to stick by what the recipe demanded, of course minus the corn syrup. It turned out that these marshmallows were the best ever I’ve tasted. Absolutely yum and totally melt-in-mouth feel. If you taste one of these you’ll realize why you may never want to go back to the store-bought ones. Making these were darn easy and hardly any effort. With no candy thermometer at hand, I was mentally prepared for disasters… what if the sugar syrup ended in a caramel… will I get the right consistency… what the heck is that soft-ball stage… will the syrup whip well to marshmallow cream… will I be able to lift these marshmallows off the tray… if these fail, then what next… ??? Quite a lot of study went into making these little sweet treats. 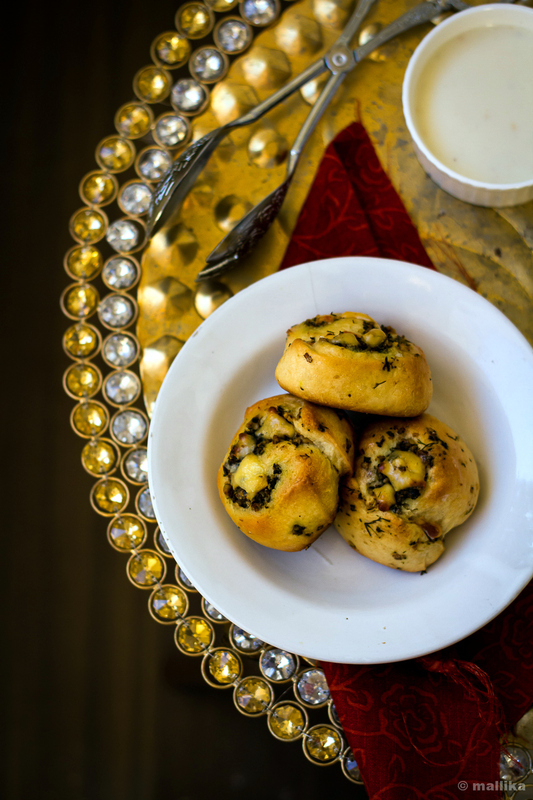 Several sites, recipes, reviews, comments which helped me gear up making these in my kitchen. 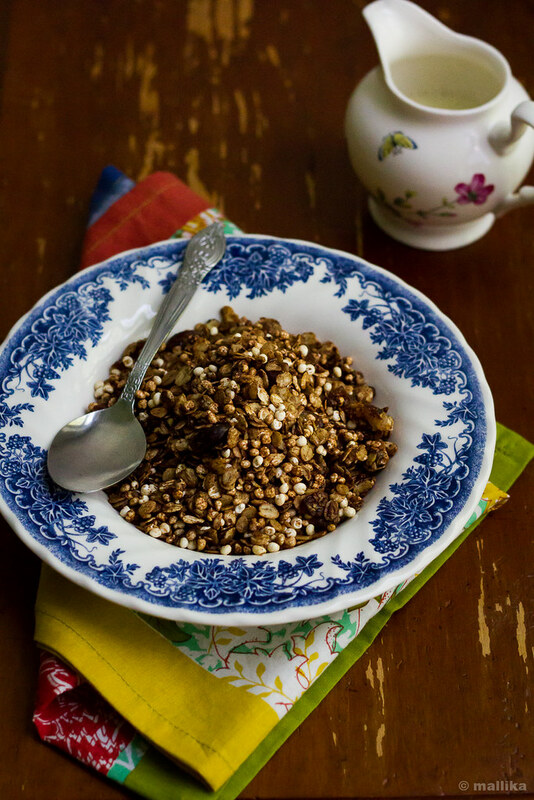 I was armed with puffed rice at hand to make rice krispies, should these fail on me. And if the marshmallow cream failed to set, my digestive biscuits and dark chocolate were at my custody for some S’mores. Bear with me, these photos were taken at night on my kitchen counter with flash on. What was meant to be a weekend activity, I ended up making these on a weekday night. Put my little tot early to sleep and nudged myself to make these, I could barely hold my excitement. Sugar syrup went on a rolling boil and I kept looking for that soft-ball stage. Every time I threw a drop of that syrup in cold water it would dissolve into thin water. I gave up on that technic and instead stuck by India method of single thread consistency. A safer bet. Dropped a tiny dollop of syrup on a steel plate, allowed it to cool a little and then checked their consistency between my thumb and forefinger for a single string. It worked well. My mixer bowl had the gelatin blooming, however the moment the sugar reached that right stage, in the final boil, I threw in the gelatin to the hot syrup and gave a quick stir. Off the flame, I put the hot vessel directly on my stand mixer and gave the hot sugar syrup the desired blitz till it fluffed up and doubled in volume. Unlike what most recipes suggest (pouring the sugar syrup down the side of the bowl into the gelatin mixture), I added gelatin to the boiling syrup to avoid any lumps or un-dissolved gelatin stuff. I guess it worked well for me. Prepare a pan: Mix corn starch and powdered sugar. Grease a square baking dish and dust with the cornstarch-sugar powder thoroughly. 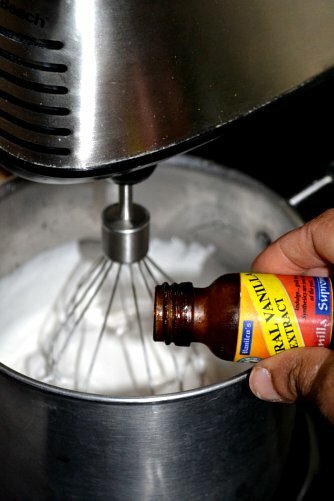 Grease a spatula with vegetable oil to transfer the prepared marshmallow cream. Sprinkle the gelatin over cold water and allow it to bloom. 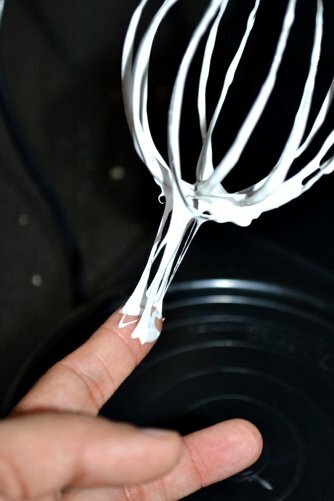 Prepare your stand mixer by attaching a balloon whisk. A balloon whisk will help in pumping good amount of air, thus helping them double faster. In a heavy saucepan, combine water and sugar. Bring to rolling boil on medium heat, stirring occasionally. If you have a candy thermometer at hand, boil it till it registers 115 degrees C (235-240 F), soft ball stage. In case you don’t have one, drop a blob of syrup on a steel plate, allow it to cool a little and then check it’s consistency between the thumb and forefinger for a single string formation. As it cools down further you should be able to roll it into a soft ball. Many recipes suggest a soft ball stage by testing the syrup in a bowl of cold water, though I’m not sure why it didn’t work for me. Sugar tends to crystallize, hence keep a keen eye on your boiling syrup. Once it reaches the soft ball stage, quickly add in the salt and bloomed gelatin to the sugary syrup. Turn off the flame immediately and give a quick, proper stir to ensure that the gelatin has dissolved completely. It took me about 8-10 minutes to reach that stage. Turn on mixer at low speed, slowly increasing it to high, beating it on the highest speed. Beat until very thick, fluffy and double in volume, about 12 minutes is what it took for me on a stand mixer. The entire mass will turn to a clean white fluff and when this cream no longer increases in volume it should be done. At this stage, add in the vanilla extract or flavoring of your choice and give a final whirl for a minute. Do not overbeat as it may stiffen and make it tougher to transfer. Do not feel tempted to touch or taste the marshmallow cream at this stage as it’s very sticky and stingy in nature and you’ll end up in mess everywhere! Using the oiled spatula, transfer the cream to the greased tin. Scrape off all the batter from the bowl and spread evenly into the prepared pan. Gently level the tops using the greased spatula. Cool overnight or at least 4 hours before slicing. 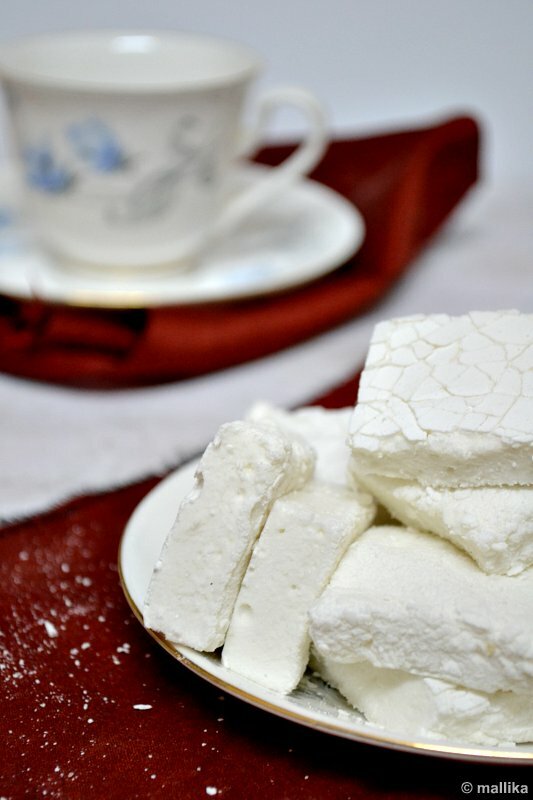 To slice, carefully transfer the entire sheet of marshmallows to a sugar-cornstarch dusted cutting board. Grease a very sharp knife or scissors and cut into desired squares. I suggest not to use a ridged knife as I had trouble cutting with them. Instead a sharp leveled knife should do that job better. 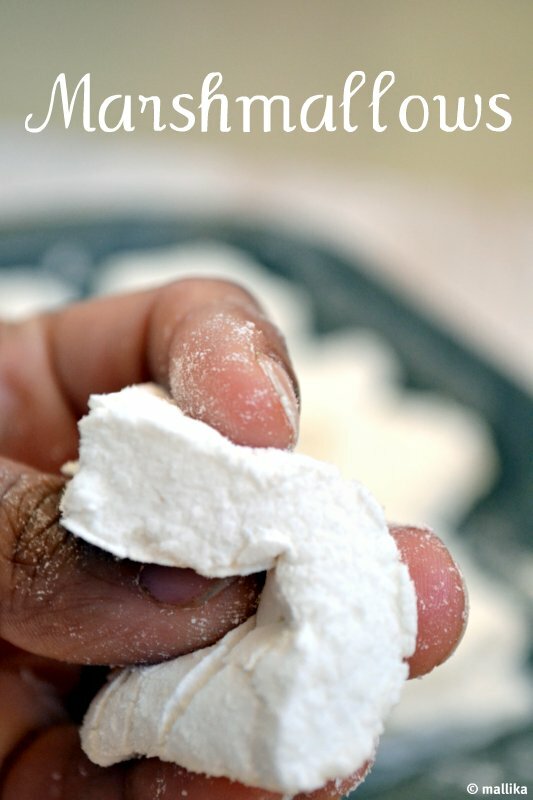 Toss with remaining sugar-cornstarch mixture until all sides are evenly coated and no longer sticky. 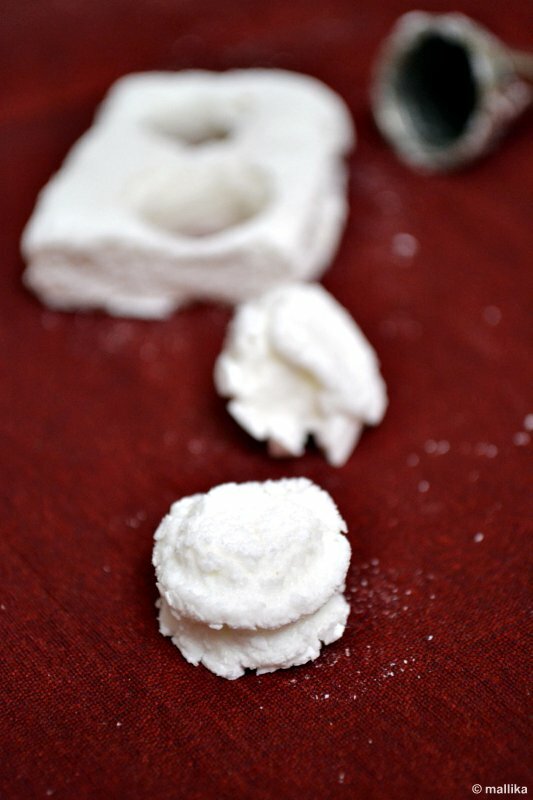 To make mini-marshmallows, I used the rear end of greased piping nozzle, pressed them down on the marshmallow sheet and cut out rounds. To be used on marshmallow floats. They keep for over a week in air-tight containers. The longer you have them, the denser they get, making them perfect for cup of hot chocolate. The entire process may sound lengthy and tedious, but honestly it isn’t much of an effort to make this fluff. Glad that these marshmallows turned out extremely yum and surpassed my expectations. My husband who’s not a fan of marshmallows too gave me a thumbs up. 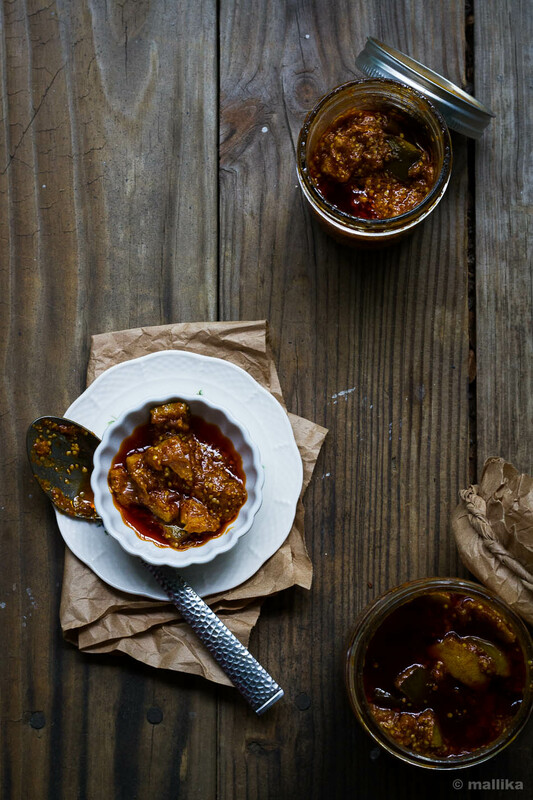 This recipe is a keeper for sure and I do intend to play with more flavors in future. Also, next on my card is an attempt to get them done the vegan way. Let’s see if the agar stuff works… will keep you posted. Ah!!! The marshmallows look so perfect. Kudos to you for trying out such a complex recipe. Great post!! 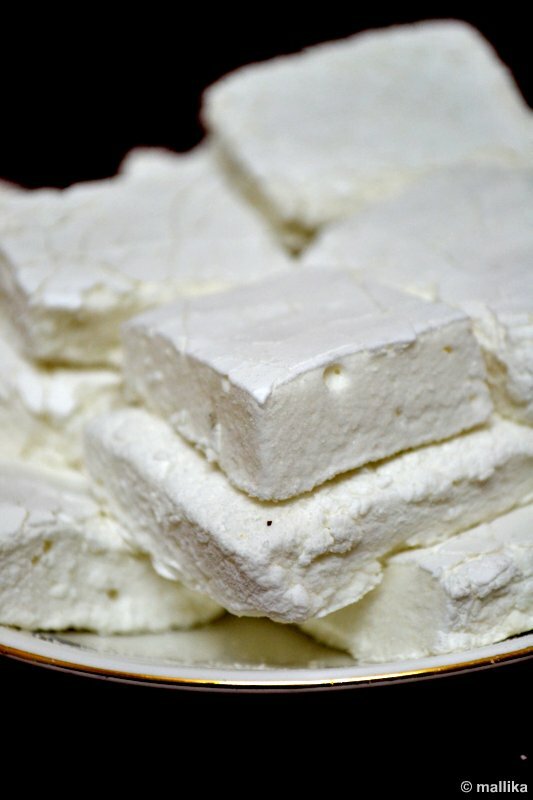 I never knew marshmallows can be made at home...nice recipe. I know how much pains I took to find it here ,next time for sure will try ur homemade version :) Nice crisp clicks too! Kudos to you! Those marshamallows look absolutely perfect. Thanks for sharing this recipe. I managed to make vegan marshmallows last week. I will be posting it soon. I thought you wouldn't be making it with gelatin because of the animal content? I used corn syrup in one batch, but avoided it in another. Agar agar went really well for me along with xanthan gum. Big fat fluffy marshmallows! Gosh, are you serious about these marshmallows being made at home without any candy thermometer and all that 'unavailable in Bangalore' stuff!! After seeing them in MC India 2 this time, I also wanted to give a try but then thought...nah! Also, I'll be glad if you could link your delights to my ongoing event. Looks so soft and fluffy. Perfectly done. Great effort.. Happy to follow you. Do check out my space when u find time. I finally made it :) Substituted honey for corn syrup. It was wonderful! Hi is corn starch and corn flour the same? Can you please try to do a recipe that doesn't contain gelatin...................... I've had trouble finding a marshmallow recipe that doesn't contain gelatin, and one that doesn't use a candy thermometer. 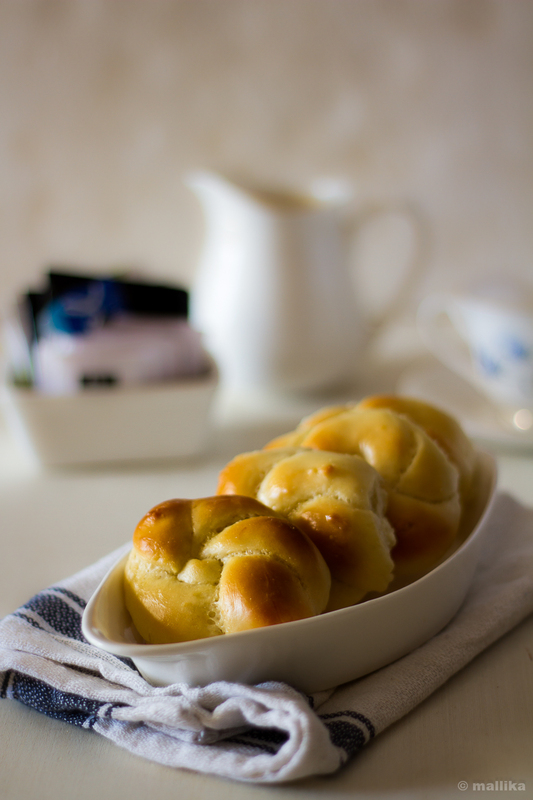 hi, thanq for d recipe of awesome delights. shd i cool the mixture before beating in mixie..pl do let me know. i wd also like to mention here that now a days vegetable gelatin is available in the market. Hi Indu, I assume you are referring to agar agar as vegetarian gelatin. I have seen the vegetarian gelatin in Nilgiris, but that does not help in marshmallows. You require the real gelatin for these. 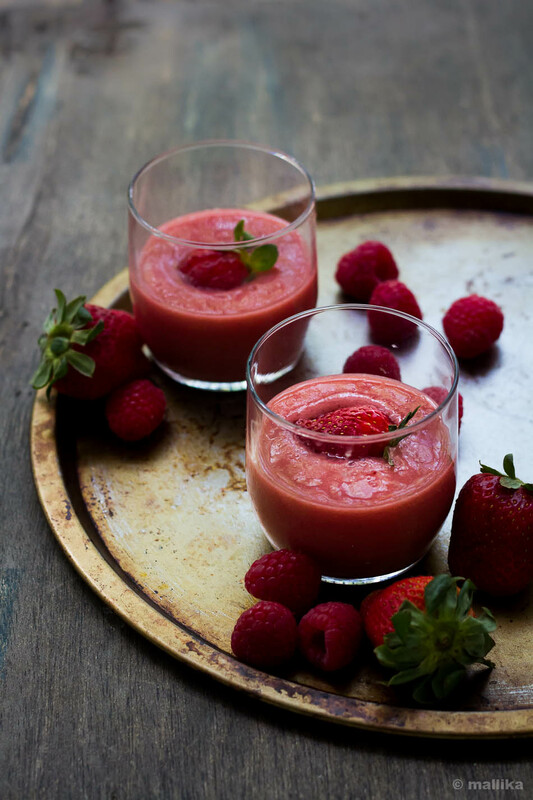 If you have success with the vegetarian gelatin version, do share with us. I am sure it will help us all. hi,thanq for the recipe of yummy treats. pl do let me know if the mixture shd be cool before beating it. i wd like to mention here that now a days vegetable gelatin is available in the market. Hi Indu, glad you liked these treats. The mixture needs to be hot while you beat. As you beat it will cool down and triple in volume. The end result will be a thick glossy white sticky mixture. Thank God for this recipe. 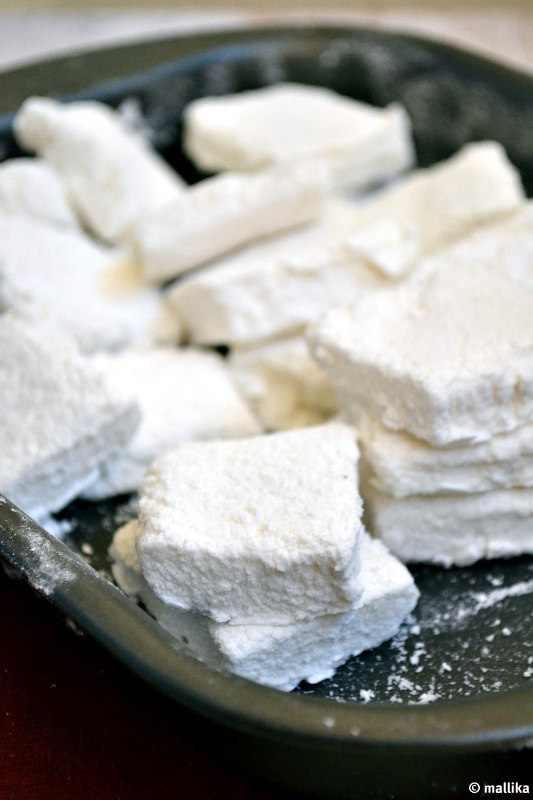 For the first time, I've found a recipe for marshmallows without corn syrup. The marshmallows look absolutely heavenly. 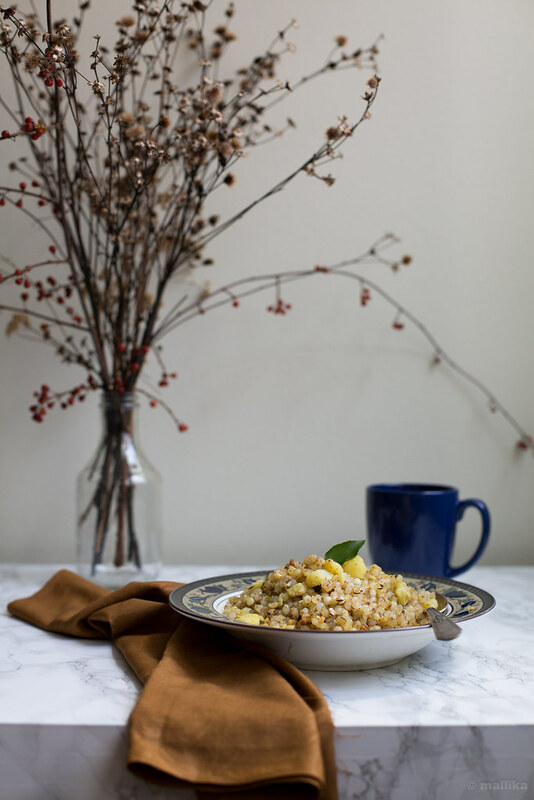 Your website shouldn't be called vegbowl because people are thinking this recipe will be vegan. But no, there has to absolutely be gelatin. I can't even right now. Hi Angela, my website does not profess being vegan. I am a lacto ovo vegetarian, and I understand that this recipe is not vegetarian. Sorry if this was misleading to you. Though there are plenty of vegan recipes here that you may like. If the gelatin is substituted for agar how much do you recommend..? ?